SpittoonExtra: Food, Photographs, EBBP and Foodography. Now I suppose it's possible my memory is playing tricks on me but I am sure Ed's Diner used to worth going to, the ideal antidote to a few too many strong continental lagers Up West. I remember many nights when at least some of the damage was undone by taking on board a decent burger, some good chips and a couple of cheesy classics from the counter-top juke box. This mini chain of retro diners was a welcome addition to a West End hardly overflowing with decent fast food. Now obviously things have moved on a bit in 2007. A new breed of quality burger joints has emerged, new contenders such as Gourmet Burger Kitchen and Hamburger Union that have, in turn, helped inspire this blog's humble hunt for the Best Burger in London. So has Ed's Diner raised its game to meet the challenge of the new pretenders? Quite the opposite it seems: on the evidence of last Friday it seems to have packed up the game, thrown away a couple of vital components and sold the rest on ebay. Friday night at 9:45 in a West End burger bar. How long would you expect to have to wait for a table? Fifteen minutes? Half an hour? Longer? Or no time at all... I actually thought the place was closing up early. In the 20 minutes or so I stuck around the only other diner was a member of staff. God knows why: he must have known how bad it would be. I knew from previous experience there was no point in ordering my burger rare (some line about them not being allowed to - I only went back for the purposes of the BBIL quest) but I was hardly prepared for the overcooked, underseasoned industrial tasting rubbish I was served up with. And as if that wasn't enough it came with grated cheese. 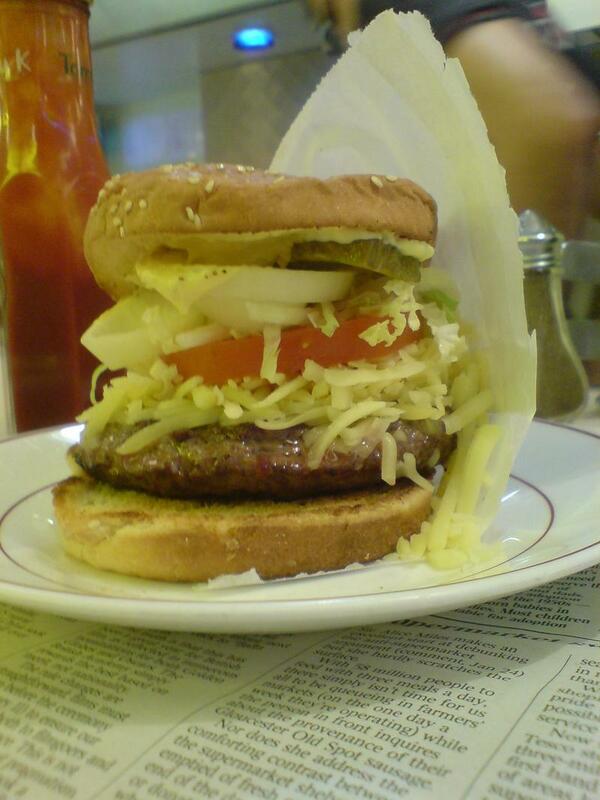 Grated cheese on a burger. WTF? The whole point of a cheese burger is to have your meat smothered with an even layer of tangy goo, somewhere between seasoning and sauce. Ed seems to think you'd rather have a lapful of cheesy flakes to go with the ordinary chips and the cheap and nasty ketchup. Dreadful from start to finish, the only saving grace being that start to finish takes only about 20 minutes. And you don't have to queue. Sounds like just the sort of place I meant in my recent review of Noodle King, when I said if you are going to eat fast food, at least don't go to a greasy burger bar or a pizza house. What a shame, because a really great home-made burger (with chunky chips) can be a great dish to cook and to eat. Sorry you have not got a clue what you are talking about. Ed's Easy Diner has been going for twenty years and have always served the best burgers in London and are 2nd to none, all these new posh burger joints have been popping up all over the place but Ed's offers a great meal with great atmosphere and friendly staff which none of the others do. Ed's was cooking fresh burgers and was concerned about what went in to their bugers long before Hamburger union and GBK. As Ed say's if you can find a better diner eat there! I reccomend that you get your tase buds sorted out. No need to apologise Adam, but I don't think it's me that's lacking clues. I honestly can't remember a worse dining experience in London. And I've had a few, believe me. Twenty years of business doesn't guarantee quality; if it did McDonald's would be the ultimate fast food dining experience, and please don't tell me you think that's the case. Atmosphere it may have (although not the one I went to at exactly the time it should have been at its most fun and friendly), but the best burgers in London? Please. If you can't find a better diner eat at Ed's, but you won't have been looking very hard. Ed's Diner is a bit of a joke these days. I honestly think you are better off going to Burger King. Of course, the food at Gourmet Burger Kitchen and Hamburger Union rather blow Ed's away.